Pomona, Calif. (February 09, 2019) – Two of drag racing’s legendary champions – one on two wheels and one on four – led a special ceremony at the National Hot Rod Association’s (NHRA) Lucas Oil Winternationals today to announce a $1 million donation to B.R.A.K.E.S. 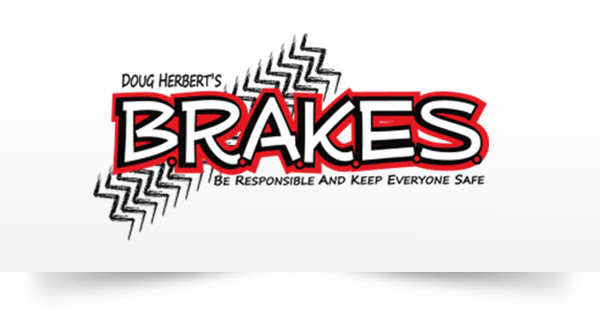 (Be Responsible and Keep Everyone Safe), a national non-profit organization dedicated to preventing injuries and saving lives by training teens and their parents to be safer on the road. Terry Vance, 14-time national champion motorcycle drag racer, title-winning team owner, and co-founder of aftermarket motorcycle performance parts manufacturer Vance & Hines, made the presentation to Doug Herbert, the multi-time Top Fuel drag racing champion who founded B.R.A.K.E.S. in 2008 after the tragic loss of his sons Jon and James in a car crash. At locations across the nation each weekend B.R.A.K.E.S. school includes four identical sessions to allow parents and teens to pick one that will fit into their busy schedules. Each session includes four hours of training, starting with a short, 45-minute classroom presentation followed by nearly three hours behind the wheel of new Kia vehicles. B.R.A.K.E.S. is NOT Driver’s Ed. It is a FREE, hands-on, advanced driver training program taught by professional instructors, including current and former members of law enforcement, professional racers, and stunt drivers. B.R.A.K.E.S. maintains a low three-to-one student-to-instructor ratio to maximize educational effectiveness. Car crashes are the number-one cause of death among teens. B.R.A.K.E.S. provides the foundational skills a new driver needs to make good decisions behind the wheel and reduce the risk of a crash. Courses include distracted driving awareness, panic braking, drop-wheel/off-road recovery, crash avoidance and car control/skid recovery – all of the biggest causes of crashes for new drivers. Other educational elements often include ‘Big Rig’ safety, first responder vehicle extrication demonstration, and what to do in the event of a traffic stop. Editor’s Note: Since a version of this story appeared in MPN in late 2017, owners Nike & Sheri Black have decided to retire and sell. Want to own a slice of American Motorcycle History? Contact Sheri Blake: sblake2051@gmail.com 727-588-0786.